Kentucky Farm Bureau Insurance's Personal & Farm Umbrella Liability Policy can give you the peace of mind you deserve. If you're interested in higher liability limits to protect your assets and future, click here to get in touch with your hometown agent. Kentucky Farm Bureau Insurance's Personal & Farm Umbrella Liability Policy is designed to provide additional liability coverage over and above your underlying liability policies. An umbrella policy provides extra protection over such policies as your auto, homeowner, or farmowner policy. 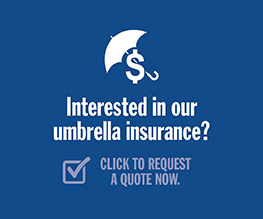 If you think you may have an umbrella claim, we can help you out. Click here to get in touch with your local agent.